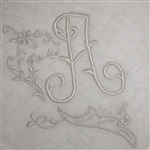 Monogrammed / Monogram handkerchiefs make a wonderful personal gift. Always great to tuck into a birthday or get well card. Very popular for brides wedding day hankie. Perfect gift for bridesmaids, mother of the bride or mother of the groom. Monogrammed hankies are listed alphabetically and each hankie comes only as shown here. If you need larger quantities please contact us. We always suggest hand washing your hankies!